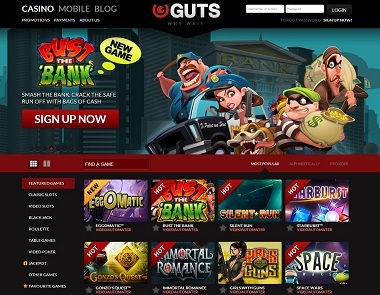 Established in 2013, Guts Casino has quickly turned into a successful online gaming brand mainly targeting players in Scandinavia, Australia and New Zealand. If You are looking for an online casino that offers a chance to play in AUD or NZD currencies and have spectacular pokie games in their portfolio, look no further. What’s differentiating them against the competition is the service offered. Withdrawals are processed within 2 hours on average and they intend to bring this down to an hour. Customer support is available around the clock via live chat, which comes handy when You have any issues. 100 up to $400 Play Now! EveryMatrix is behind the greatness of Guts and they fully empower everything this casino has on offer. This includes all games, sports-book and their mobile casino. Though they don’t offer the games, just the platform. You’ll be able to play a diversified range of online pokies from multiple well known providers at Guts. Not that it’s anything special, but having these pokie machines in one place is definitely handy. Their main focus is on pokies created by Net Entertainment, as they are by far the most popular in Scandinavia. You will also find hundreds of other games from companies like MicroGaming, QuickSpin, BetSoft and Play’N’Go. Some of the games we suggest trying at Guts Casino are Starburst, Twin Spin, Dead or Alive, Thunderstruck 2 and Mega Fortune. New players residing in New Zealand and Australia can get a special welcome bonus offer. Open an account at Guts.com and receive 15 free spins on the Twin Spin pokie. No deposit is required! 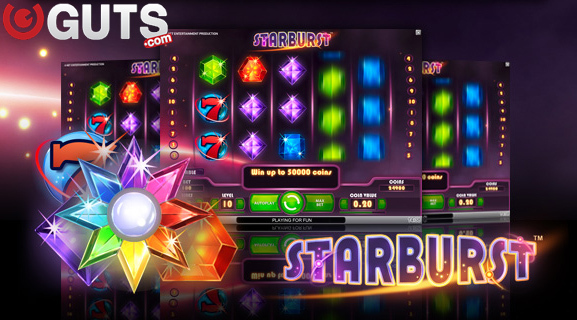 1st Deposit – 100% match bonus to $50 free plus 50 free spins on Starburst. Use code GUTSW1 when depositing. 2nd Deposit – 50% up to $100 cash bonus. Use code GUTSW2 when depositing. 3rd Deposit – 50% up to $100 cash bonus plus additional 50 free spins on Starburst. Use code GUTSW3 when depositing. Then on top of this You’ll also get to participate in all their promotions that can be fairly exciting from time to time. Prizes include trips to Dubai, tickets to finals of exclusive sports events and just cash. EveryMatrix have created one of the greatest mobile casino platform and Guts surely utilizes it well. Their portfolio of mobile pokies includes over 80 titles with Twin Spin, Starburst, Dead or Alive, Immortal Romance, Thunderstruck 2 and many others offered. The casino will run on just about any relatively modern mobile phone or tablet. We tested all of their pokies on iPhone, iPad and Android gadgets and were able to play them without a problem. Guts Casino offers the following methods for making deposits and withdrawals. They might differ depending on the country You reside in, so keep that in mind. You can simply open a free account and check what methods are made available explicitly for You. Deposits are limited to $5,000 per transaction, but of course multiple ones can be made. Withdrawal limits depend on the banking method, but can be as high as $10,000 per transaction for e-wallets. We did not point out the great selection of games and platform they offer, because it’s available at other casinos powered by EveryMatrix too, such as CasinoLuck and Leo Vegas. Having that said, if You’re looking for an online casino with a great selection of pokies and one that will be available on Your mobile device, Guts is a perfect choice. 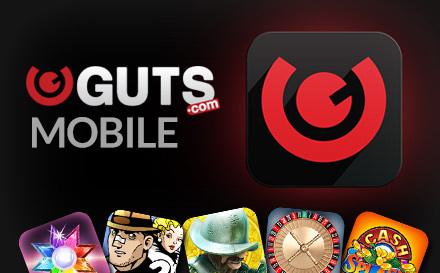 Join Guts For $400 Free + 100 Free Spins >> Play Now!